5:40 PM PT — The procession is finally approaching Marathon Clothing — at the intersection of Slauson and Crenshaw — and the crowd is THICK. Thousands of fans are lining the streets leading up to the store … where even more people have gathered. Several Nation of Islam security guards are surrounding the hearse as it slowly rolls through the crowds. The Eritrean flag is draped on the roof, repping for Nip’s heritage — his father emigrated from the east African nation. The funeral procession is about to begin … with the route looping through South L.A., and ending at the Angelus Funeral Home. 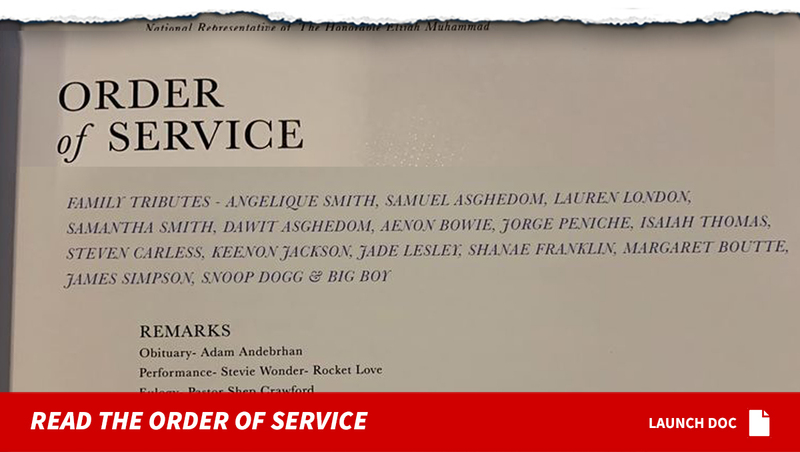 12:35 PM PT — Nipsey’s mom and dad just got onstage … where his mom shared one of the final text message exchanges she had with her son. She also spoke of what a great man he was and how he was such a light in his community. 11:54 AM — Lauren was onstage just moments ago with her and Nipsey’s kids. 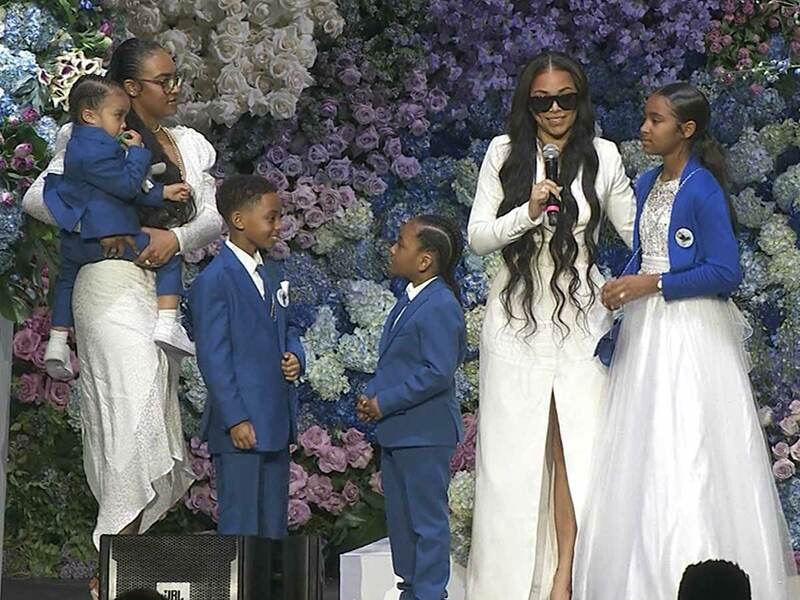 Lauren’s son, Kameron, shared a dream he had about Nipsey rising out of the ocean before leading the crowd to chant “respect.” The family then gave way for Jhene Aiko to come onstage and sing. 11:07 AM PT — The Celebration is now underway. 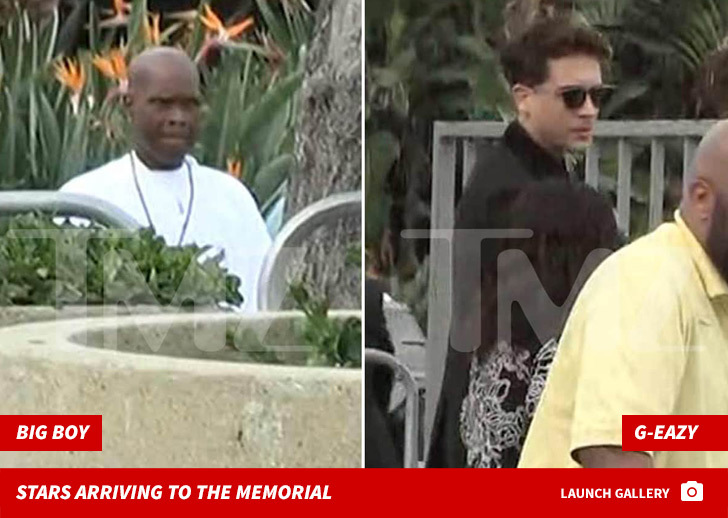 Nipsey Hussle‘s Celebration of Life is about to begin at Staples Center, and TMZ is live streaming what’s expected to be a very emotional memorial service. The slain Crenshaw rapper is being honored with a spectacular service in downtown L.A., where 21,000 people will turn out to pay their respects. So far Jay Z, Beyonce, G-Eazy, Big Sean, Big Boy, James Harden, DeMar DeRozan, Russell Westbrook and Meek Mill have arrived for the event. 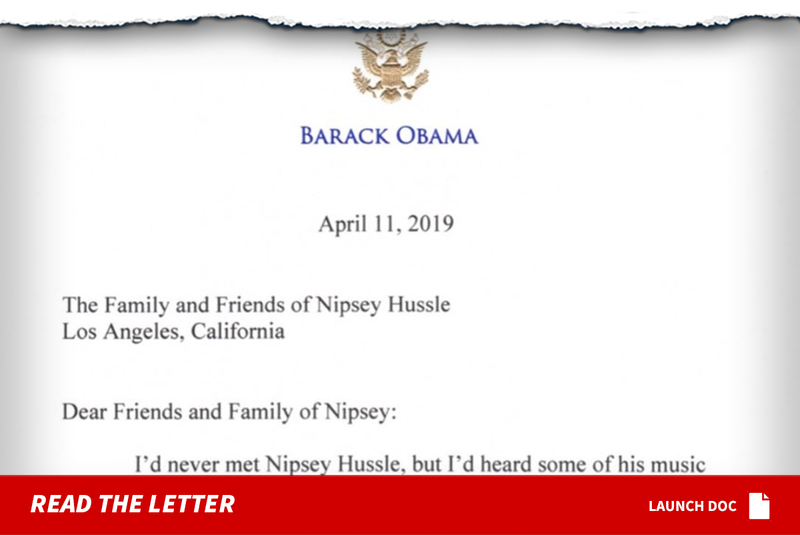 The ceremony opened with a surprise … a reading of a letter sent to Nipsey’s family by President Barack Obama. 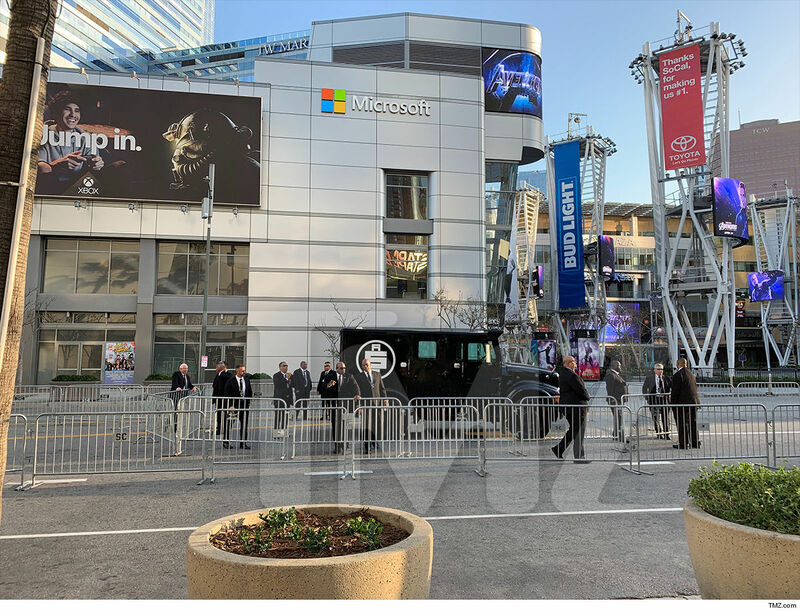 Nipsey’s armored truck with his All Money In record label logo is parked outside Staples and, as you can see, it’s heavily guarded. The truck is normally a fixture outside his Marathon Clothing store. The service starts at 10 AM sharp and runs through noon. Afterwards, a funeral procession will carry Nipsey’s casket on a 25-mile trek through much of the city, stopping at important landmarks like his store, and ending at a funeral home. 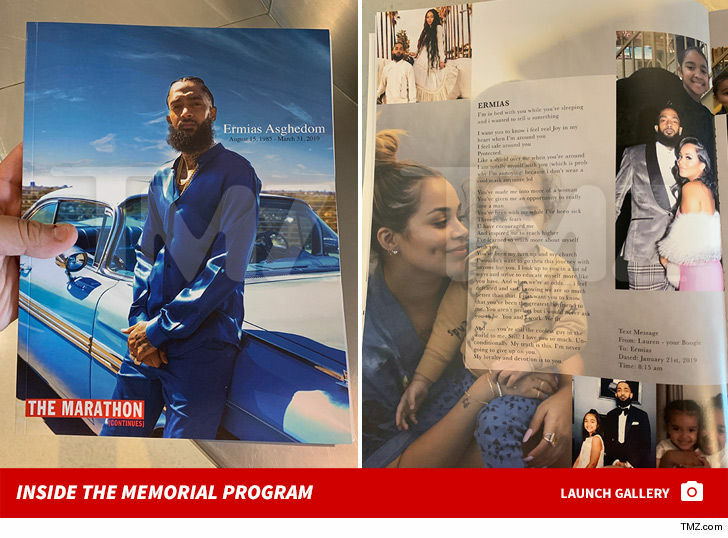 We’ll be live streaming the procession as well … throngs of fans and supporters will be flooding the streets, as Nipsey makes one final victory lap through the neighborhoods and communities he fiercely supported. Nipsey’s shocking death is prompting extraordinary developments in L.A. — a full peace treaty between several gangs, who are putting down firearms and showing more unity to honor Nip. Gang leaders from Watts, Compton, L.A. and Inglewood already marched for peace. As we first told you … Nipsey was gunned down March 31 outside his store in the Hyde Park area of L.A.. He died from gunshot wounds to the head and torso and was pronounced dead 35 minutes after being shot. 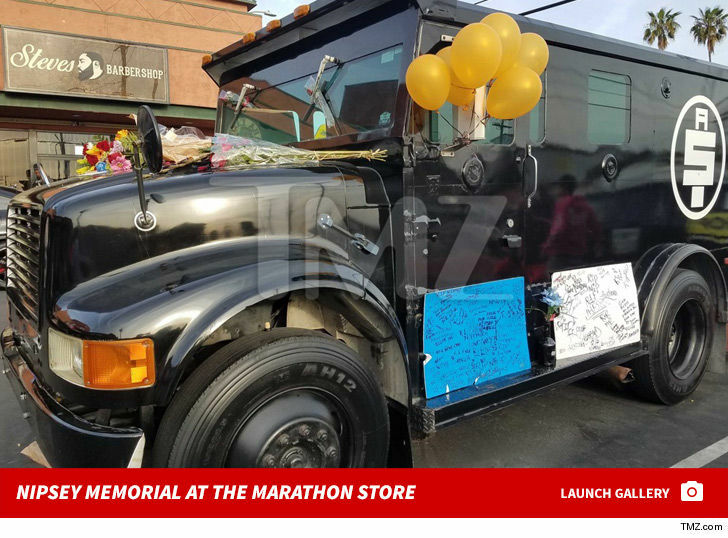 In addition to this morning’s celebration of life … fans have been leaving messages, candles and flowers in the parking lot outside Nipsey’s store, and his family and friends mourned him Wednesday afternoon during a private viewing.